What is an availability zone? 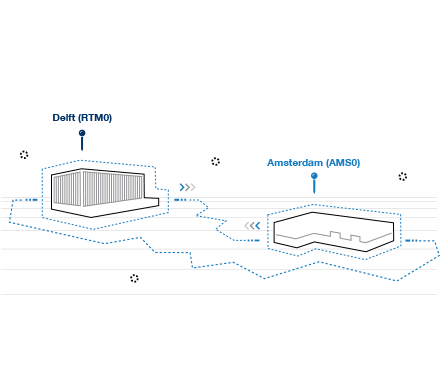 Your TransIP services are delivered in one of our two availability zones in Amsterdam (AMS0) or Delft (RTM0). An availability zone is a separate data centre that has its own power supply (2N) and its own network. Availability zones can operate completely independent of each other. 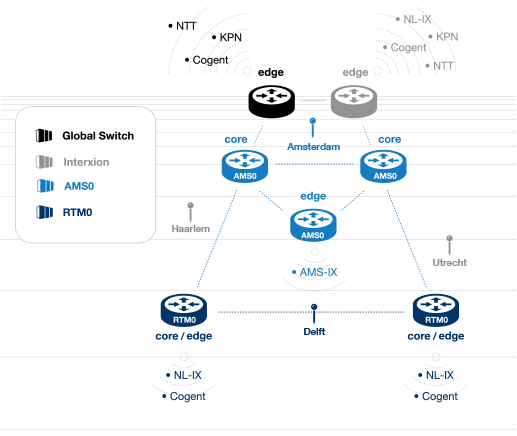 Our two zones (AMS0 and RTM0) are connected by means of a redundant low latency connection. Should an availability zone (e.g. Amsterdam) become unavailable (e.g. because of a natural disaster), this will not impact the other availability zone (e.g. Delft). An overview of which services can be used in our availability zones can be found here. How are both availability zones connected with each other? Our core- and edge network are divided over our own availability zones and the two satellite locations Interxion and GlobalSwitch. Through these four locations (listed below), we are connected to our peering and transit providers. Our availability zones can operate completely independently of each other, but at the same time they can use each other's providers. Traffic enters your VPS via our redundant core network. Each hypervisor has a 20Gb / s (2x10) connection with our IP fabric network which is based on the BGP routing protocol. We use VXLAN for the private network connections. What do I notice if an availability zone becomes unavailable? If for whatever reason an availability zone becomes unavailable, the impact is dependent on the TransIP services you use as well as your configuration. You make use of HA-IP (Pro) with a minimum of one VPS in each datacenter. The VPS'es connected to HA-IP (pro) are configured identically. People who make use of the services hosted on your VPS'es, will notice nothing of the unavailability of RTM0. While the unavailability of RTM0 lasts, your VPS in AMS0 will take over the traffic (automatically if you use HA-IP Pro). You make use of HA-IP (Basic) with a VPS in AMS0 attached to it and a back-up ready in RTM0. You use one (or multiple) service(s) in AMS0: You notice nothing of the downtime in RTM0. You make use of HA-IP (Basic) with a VPS in RTM0 attached to it and a back-up ready in AMS0. The downtime will only last as long as it takes you to switch your HA-IP to the VPS in AMS0. You use one (or multiple) service(s) in RTM0. You use services in both AMS0 and RTM0 without optional redundancy (e.g. a VPS in each zone). We fully intend on offering availability zones in other countries (besides the Netherlands) in the future. Would you like to be notified when more information becmes available? Click the 'like'-button in the corresponding feature request.